Still cleaning out the draft folder, and it's worth mentioning this one just for the headline. It happened in Belarus in 2011, where dinosaurish old-school dictator Alexander Lukashenko was (as he still is) happily oppressing his people and presiding over the collapse of whatever economy remained in the former Soviet state. 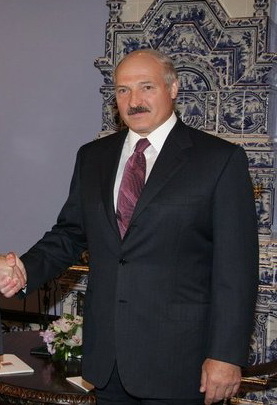 Lukashenko was elected in 1994 and has been president ever since, having repeatedly won in the kind of elections where the winner gets 93.5 percent of the vote with the remaining 6.5 percent going to his mustache. He has charmingly described his own son as "a useless weakling" and recently told Germany's (openly gay) foreign minister that it was "better to be a dictator than gay." Assuming those to be mutually exclusive categories, then most of his own people would prefer he come out of the closet (and then go into exile). He is a thug. And so it is not surprising that when public protests broke out in 2011 over the collapsing economy, Thugashenko responded by having thousands arrested for whatever reason or no reason at all. Most of them, according to the Christian Science Monitor, "were fined heavily or jailed for up to 15 days on police court testimony that they were expressing a political opinion by clapping their hands." Activists and protesters there had adopted applause as a symbol of protest, which is brilliant because now that clapping has been associated with dissent, the regime reportedly has had to forbid it at its own events, such as traditional military parades, which must parade along silently. Authoritarian regimes rely heavily on forcing people to play along, and now forced applause is not an option. I remember a report that at first Lukashenko was quite pleased with what seemed like a big increase in public approval based on the response to his speeches, only to be infuriated later when he learned it was all protest applause. I can't find that report now but would like to believe that's true.